The transition from off-staff to on-staff note reading is a milestone for primer piano students; it is when they become “big kid” piano players. This milestone is marked by a flood of concepts and skills to be learned. One of these early skills involves the recognition and understanding of Middle C and its stem directions. Recognizing “stem up” and “stem down” Middle C’s and then correctly identifying their corresponding staves is essential for young piano players. Today we’re sharing a printable you can use to reinforce this primer-level concept. It can be used as a standalone activity or as an accompanying, off-the-bench resource for WunderKeys Primer Book 1, Lesson 5. 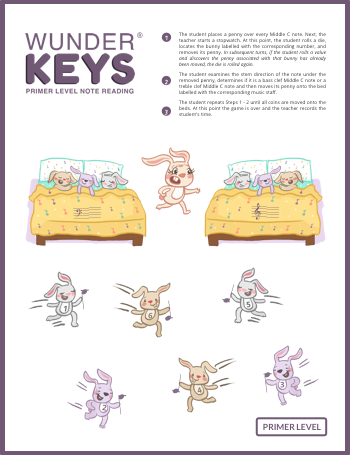 To help your piano students identify “stem up” and “stem down” Middle C’s and correctly sort them to Treble or Bass Clef staves, click on the image below to download today’s printable. And while you’re here, don’t forget to check out our WunderKeys Method Books on Amazon. Our primer series is carefully designed to make on-staff note reading natural and simple by removing the difficulties young beginners typically encounter. Find out more here.